On June 6th, I visited the Jersey shore along with my wife and some of her siblings. Since I was driving, it was a bit of a catastrophe getting there, but all in all it was a lovely day. We went to Barnegat Bay and beached ourselves near the famous old lighthouse on the northeast tip of Long Island Beach. The sea breeze and sound of breaking waves--these are things no person should go without for too long, and it was very nice to walk along sandy shores again. The birding in the area was also exceptional, at least for an Arizonan like myself. 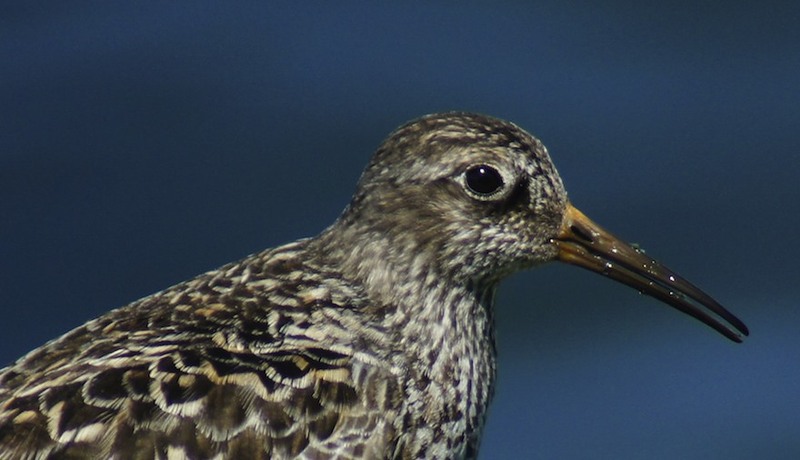 I photographed a lot of new species, but perhaps none more interesting than this super late Purple Sandpiper. I recognized the bird and was very excited to see it for the first time, but having very little experience with shorebird IDs, I didn't think much on the matter while at the beach. It was only while entering my sightings into eBird that the little flag shot up. 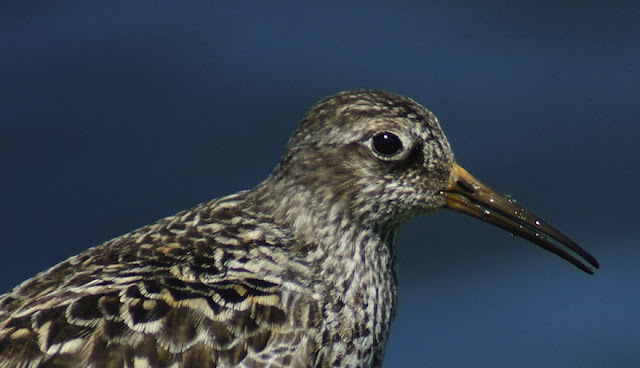 From what I could tell, this was only the second June sighting of a Purple Sandpiper in New Jersey in the last ten years, and the last one had come in 2003. These birds winter along the Atlantic coast, but it is very unusual to see one still lingering in June. 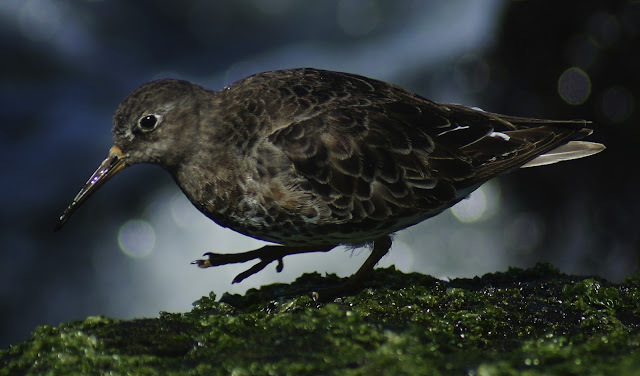 Thus, I am only left to conclude that this Purple Sandpiper waited around expressly for me to come and see him, which was very cordial of the stout little shorebird : ). It's a beautiful species, and it was a pleasure to watch him scuttle and forage along the rocky wharf with a dexterity I could not manage even in my dreams. On this third photo, I can actually see and appreciate the subtle purple coloration on the feathers, which I'll admit escaped me while observing the bird in person. 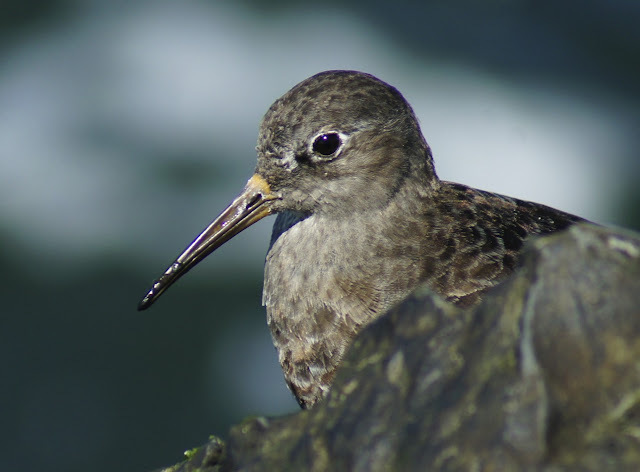 After examining some other photos and getting some helpful input from some expert birders, I discovered I had seen a second Purple Sandpiper in its breeding plumage! This one traded in its purplish hue for a buttery gold. It was a sharp-looking bird, but I must admit I preferred the first molt. 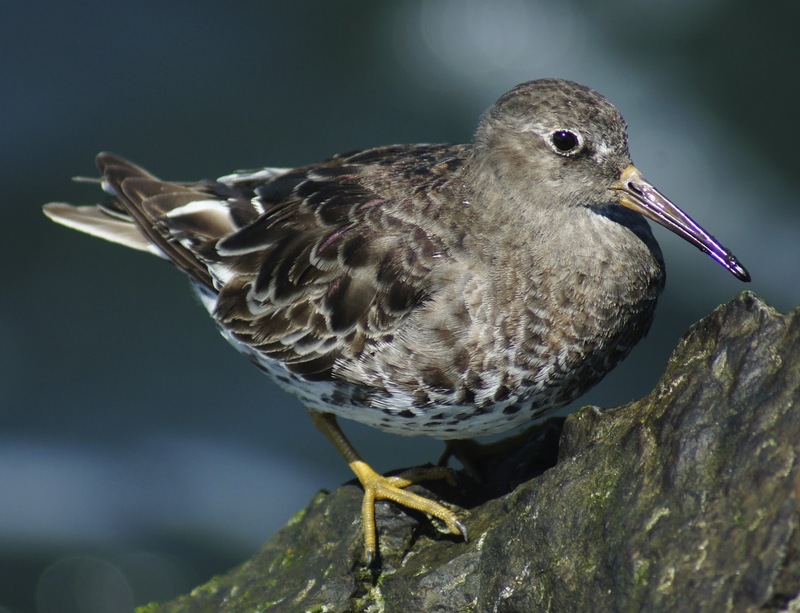 The Purple Sandpiper is referred to as a bird of extremes. 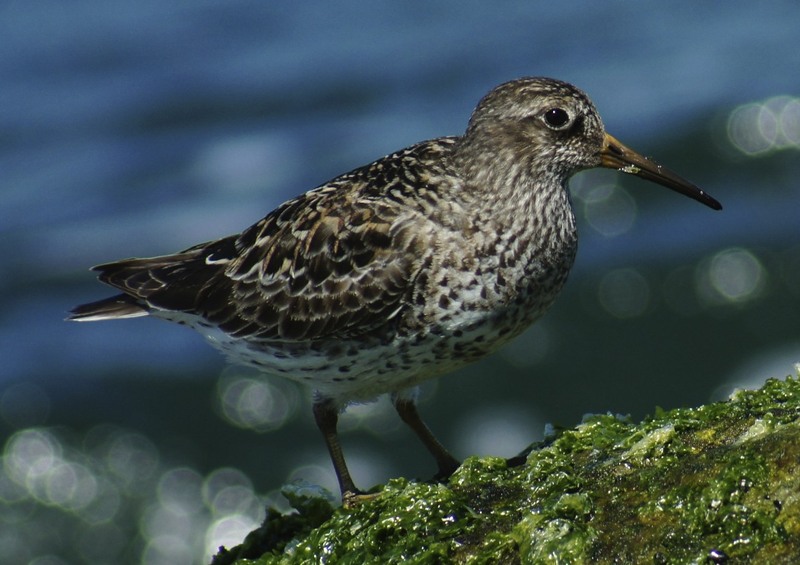 It likes to feed near breaking waves that threaten to sweep it out to sea at any moment, and it winters farther north than any other shorebird. I guess this pair wanted to prove that they were indeed extreme, but by no means predictable. Now perhaps they're going to stick it out through June longer than any other arctic breeder, so ha! Congrats to you. What a beautiful little shore bird he is...and purple is my favorite color!!! Thanks Robbie. It's easy to pass over a lot of shorebird species without a second glance, but the Purple Sandpiper, like many others, is really worth a double-take! Wow, what a terrific find Laurence! I love the bits of the purple hue on the feathers too and it seems like there is a bit on the bill as well. Gorgeous shorebirds! Thanks Mia. As you've said many times, the shorebirds sometimes make ya work to find the beauty, but their intricate plumage holds marvels of color and design that are always worth a nice long look. Congrats, Laurence! Beautiful images and fine observation! I always love to learn something new. Thank you Hilke, me too! What lovely photos!Beautiful color on the bird too. Thanks Linda. It all came together very well. Great sighting Laurence. It seems that out-of-state birders seem to find out-of-season or vagrant birds quite frequently. Sometimes that fresh perspective and unbiased approach allows the visitor to see more. Super photos Laurence, love the details, especially of the breeding plumage, i usually only see these guys in winter at a distance. How cool to come all this way and get a rarity! I'm currently using a Sony 75-300mm telephoto lens with a 1.4x teleconverter. Since it's Sony stuff, this lens will only work on Sony cameras without an adapter (if even). The lens is decent and suits my purposes. 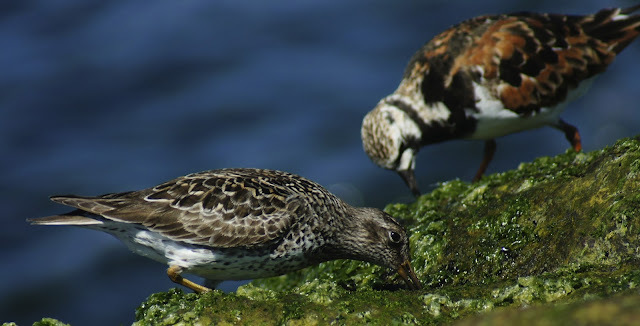 I can safely say here though the nice photos I got of the Purple Sandpiper are unusual for me : ). I was lucky in that this bird let me get very close, within 12 feet or so. Proximity is still the key for me. Good luck with your shopping, thanks for commenting. Thanks for the info Laurence, I'm a Nikon user but will check out the 75-300mm options... Keep up the good work! Laurence, what a fabulous find! So very exciting! The subtle purple feather tones are lovely. I believe the bill looks like it has a slight purple tinge to it, too. Your photographs are fantastic! Great post! Thank ya so much Julie, that means a lot coming from a photographer of your quality!